Saturday we had a real treat. 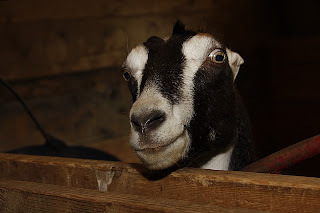 We went to the Catskills to visit my Mom and (1) she was feeling well enough for a little "road trip" and (2) she had a place in mind, her good friend (lives two towns over) had news of triplet baby GOATS recently born. Marcia had a (passive) role in inspiring Tom to propose to me so she has a special place in our hearts (as well as in Mom's). There are all Tom's photos as I have not had the time to process mine yet (hence the title"part one"). Marcia and Randy have a great place, they built it themselves and what a place. Tom climbed into the stall with the goats. I just love this photo that Tom created. I'd like to see it edited and printed as a vertical! Those eyes! The sound that the babies made just warmed our hearts. This is the runt, who could escape from the pen because it was so small. It really took to Tom and folowed him everywhere (I think that because it had imprinted on Randy it liked Tom). Tom and the goat both lept around the field. 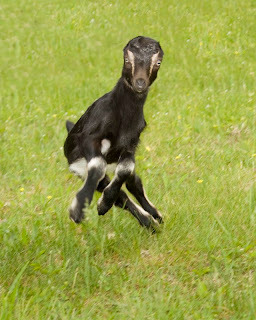 This was Tom's favorite of the little goat from the day. I have photos of Tom with the goat so I will post them soon. They also had nesting birds on their property. Bluebirds had the first run of this house this Spring but it was currently inhabited by beautiful iridescent Tree Swallows. 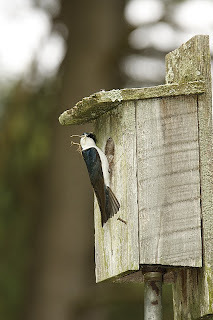 You could hear the babies chirping inside and both parents were very busy feeding them. Too bad we did not bring any big lenses! I grew up with Randy & his family, and Marcia & Randy remain great friends. I love your photos! What is a model release?? ?